Michael Rooker is an American actor best known for his turn as the blue-skinned alien Yondu Udonta in the top grossing Marvel films Guardians of the Galaxy, and Guardians of the Galaxy Vol. 2, and also as the character fans loved to hate on AMC’s worldwide hit television show The Walking Dead, Merle Dixon. Rooker has thrilled fans for decades with complex portrayals of characters audiences can’t help but cheer on despite their dark personas. He made his film debut in 1986 playing the title role in Henry: Portrait of a Serial Killer, a film based on the confessions of serial killer Henry Lee Lucas. He has since appeared in numerous films including Mississippi Burning, Sea of Love, Days of Thunder, JFK, Cliffhanger, Tombstone, Mallrats, Rosewood, The 6th Day, and Jumper. Rooker also has a prolific relationship with writer/director James Gunn, appearing in Gunn-helmed productions Slither, Super, The Belko Experiment and Marvel’s Guardians of the Galaxy franchise. He has guest starred on numerous TV shows including Stargate SG-1, CSI: Miami, Las Vegas, JAG, Numb3rs, Law & Order, Chuck, Criminal Minds, Psych, Burn Notice, and Archer. He added his voice talents to Activision’s video game The Walking Dead: Survival Instinct. Rooker’s voice-over work in video games has also included Mike Harper, the lead character in Call of Duty: Black Ops 2, and the villain Vikke in Lollipop Chainsaw. 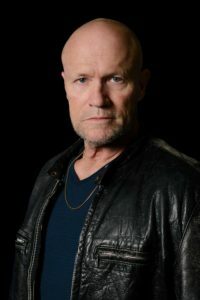 Rooker, who has eight brothers and sisters, was born in Jasper, Alabama and studied at the Goodman School of Drama in Chicago, where he moved with his mother and siblings at the age of thirteen, after his parents divorced.